Easy to use Free Digital Signage software that works on any Windows (2000, XP, Vista, 7) PC connected to a TV or Monitor. Free Digital Signage Manager Software displays Images, Video, Websites, Custom Messages and RSS Feeds. 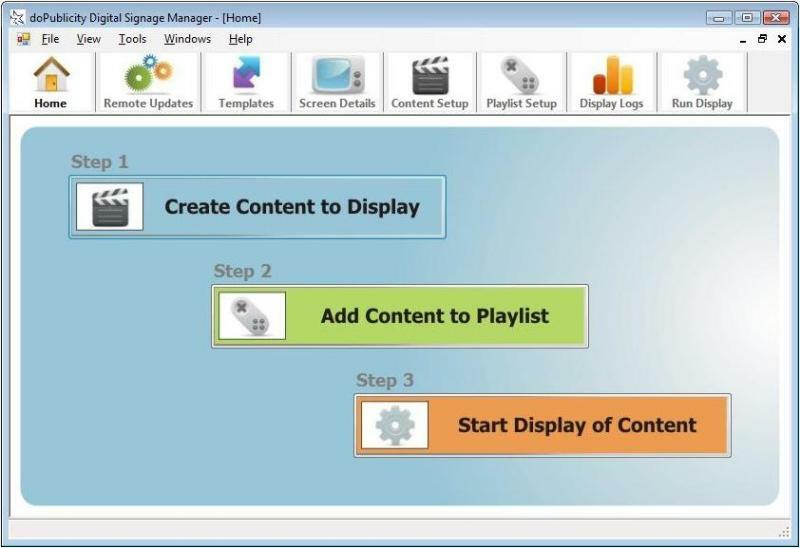 Free Digital Signage Manager Software is a solution that lets users manage Screen, Content and Playlist settings using simple wizard type interfaces. Display using multiple screen formats which include an assortment of Single / Split screens in both Horizontal and Vertical format. Split Screens can be used to display multiple media formats simultaneously. Example: The left side of the screen could should a video, while the right side displays an image. Dayparting is the practice of dividing the day into several parts, during each of which a different type of Content suitable for that time is aired. Qweas is providing links to Free Digital Signage Manager Software 4.31 as a courtesy, and makes no representations regarding Free Digital Signage Manager Software or any other applications or any information related thereto. Any questions, complaints or claims regarding this application Free Digital Signage Manager Software 4.31 must be directed to the appropriate software vendor. You may click the publisher link of Free Digital Signage Manager Software on the top of this page to get more details about the vendor.